I’ve been squashing my yen for portraits. I painted people from 2000 to 2005, and then found myself in a room full of stares. Portraits used to be the thing to have before daguerreotypes came to be. In every tasteful dwelling, there hung an oversize oil painting of Crusty Old Ancestor scowling over the fireplace. Now we have thousands of pictures on our computers never to be printed, although we swear we’ll print them someday. 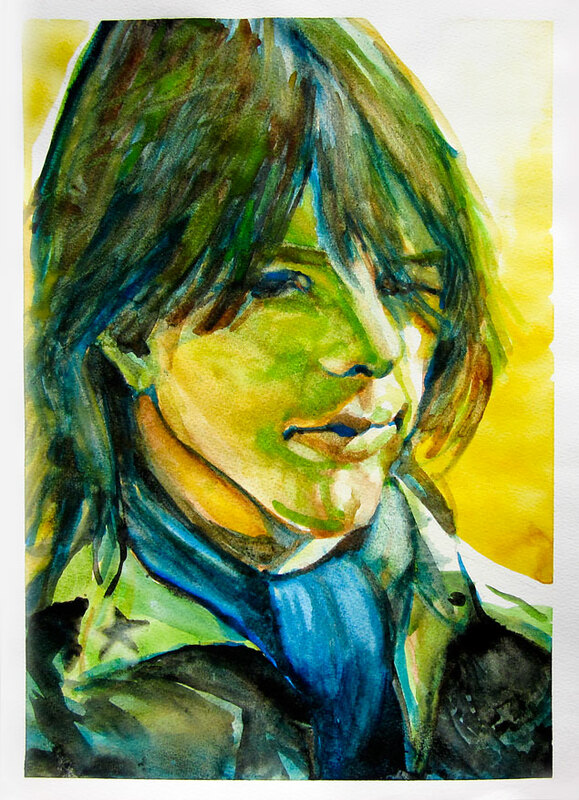 This is Gram Parsons, inventor of Cosmic American Music. His life could have come straight out of a Tennessee Williams play, or at least the Twilight Zone. His family owned the largest citrus plantation in Florida, thriving in rapidly rotting opulence. Raised a true Southern gentleman, he was reported to have always pulled back chairs for all the ladies. Gram was both blessed and cursed with the bad combination of unlimited wealth and a hereditary addiction to alcohol and drugs. Growing up, there were numerous toys and gifts, wild bourbon-fueled parties, a giant swimming pool. His father committed suicide when he was 12. His mother drank herself into oblivion and died the day he graduated high school. His stepfather had a pet ocelot and drove a Jaguar convertible. Gram played with the International Submarine Band, the Byrds, and the Flying Burrito Brothers. He turned out two brilliant solo albums, GP and Grievous Angel, then died of a heroin overdose at the age of 26, on the verge of hitting his stride and making music history. He not only sang sad country songs, he was a sad country song. Like so many other musicians of his time, God only knows what he could have accomplished had he lived. But with a life so complicated with tragedy and hereditary addiction, it seemed destined to be short. This entry was posted in Art, drawings and tagged Cosmic American Music, Gram Parsons, Grievous Angel, Tennessee Williams by selina. Bookmark the permalink. I seem to be reaching out less. By others. I am my best fan. I like your work and words. I feel the same. I have stopped caring that nobody cares and put it out there anyway. Thank you to you, however, for caring!